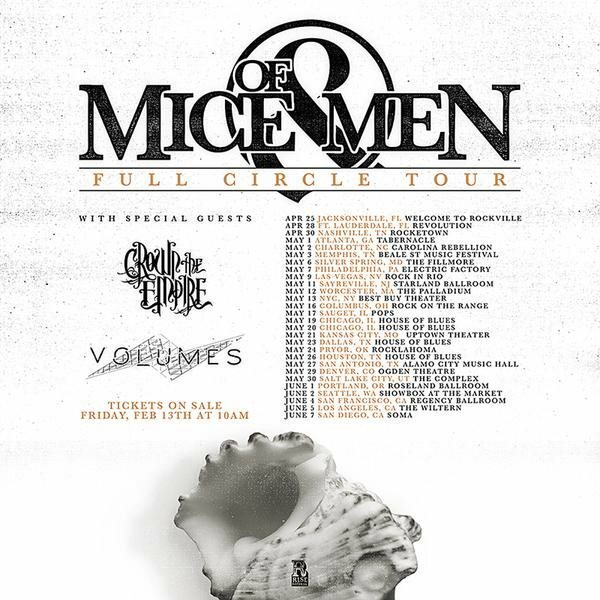 California-based rock quintet OF MICE & MEN has canceled the remaining dates of it "Full Circle Tour" after the band's lead singer, Austin Carlile, was hospitalized for undisclosed reasons. Said the group in a statement: "Austin Carlile was admitted to a hospital yesterday morning, and, per doctor's orders, has been kept in overnight for evaluation. "The band regrets not being able to perform for their fans and hopes to be back in [San Diego and Mexico City] as soon as possible. "Refunds for both shows will be available at point of purchase. However, OF MICE & MEN are planning to reschedule both shows for a later date in the year. "We will have more news on this in the the coming weeks and tickets holders are welcome to retain their tickets, as they will remain valid for these rescheduled dates." OF MICE & MEN's "Restoring Force: Full Circle" deluxe double-disc, foil-stamped digipack that includes three brand-new songs and an acoustic version of the band's hit single "Feels Like Forever" was released in February. The new songs — "Broken Generation", "Something To Hide", "Never Giving Up" and the acoustic version of "Feels Like Forever" — were recorded last fall with producer David Bendeth (PARAMORE, BRING ME THE HORIZON) in Southern California. The two-CD set is a special reissue of the album "Restoring Force", which hit No. 4 on The Billboard 200 chart and No. 1 on both the Billboard Top Independent and Top Rock Albums charts.